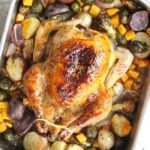 Ok folks, I don’t like to toot my own horn but this Maple Roast Chicken with Vegetables recipe is downright amazing! 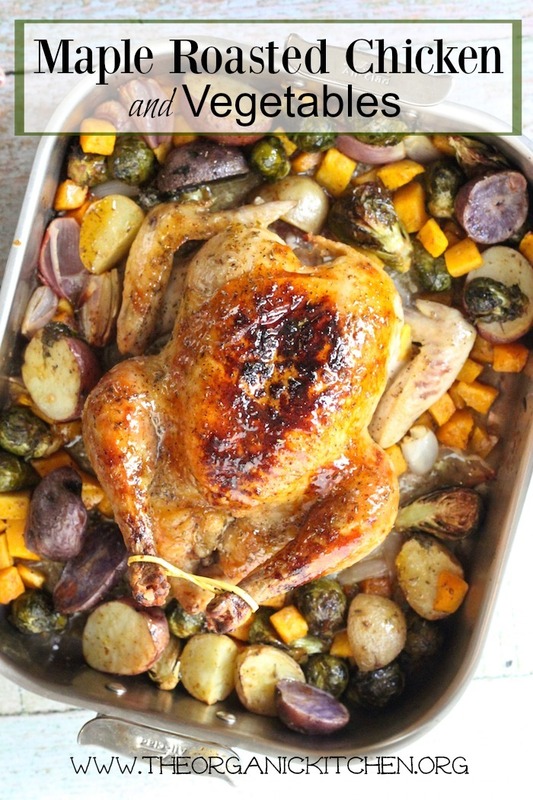 In fact it may be my best roasted chicken yet, and it’s here just in time for the holidays. Every time I make this chicken, I can’t wait for it to come out of the oven. Waiting to carve it is excruciating, but the wait is worth every second. What Gives It That Kick? …and roasted until the chicken is perfectly browned and crispy, then brushed with an orange maple glaze. The vegetables are cooked until caramelized, making them even sweeter! Are you hungry yet? 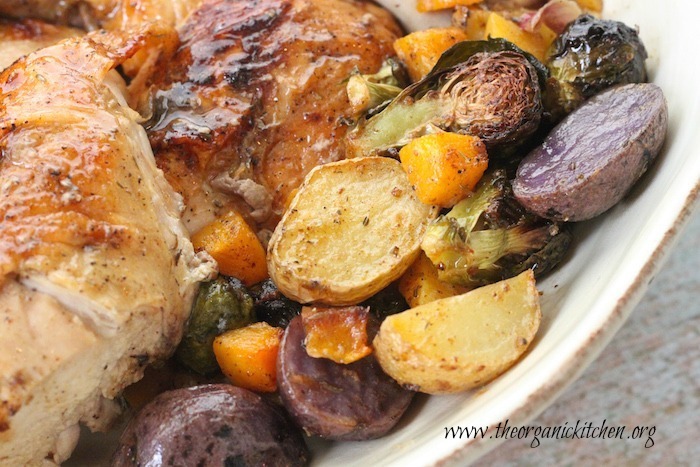 I use some of my favorite vegetables in this recipe: Brussels Sprouts, tri-colored potatoes (new rose, purple and white), shallots and butternut squash. You may use pre-cut butternut squash from the store if you wish, just make sure it’s really fresh. If you want to peel and cut your own, I have some tips. 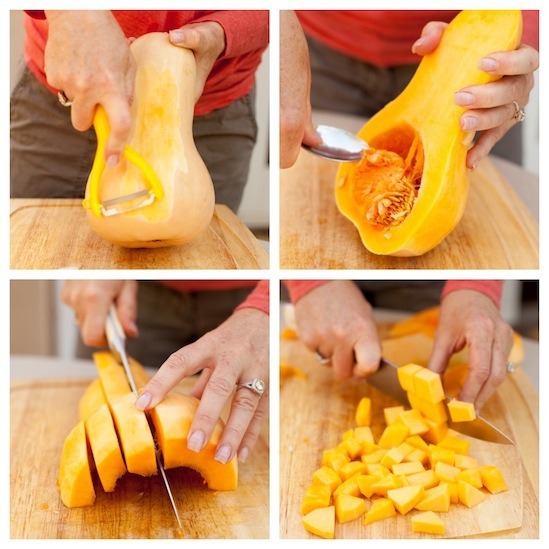 Working with butternut squash can be difficult unless you have the right tools. You need a good sharp knife (my favorite on sale now!) and a Y peeler . With these two tools peeling and cutting a butternut squash is a piece of cake! You will need a good roasting pan (I use this All Clad), a good knife (this is my knife on sale now for lower than I have ever seen it! ), a basting brush and a Y peeler (for squash, trust me). To learn to carve a chicken watch my video tutorial here. Save the giblets and bones to make nutritious bone broth! A spicy, sweet and savory chicken dish! Be sure to save giblets and chicken bones for broth making! Remove giblets (save for later if making broth) rinse chicken inside and out and pat dry with paper towels. Season entire chicken with sea salt and freshly ground pepper, place in roaster breast side up. Tuck wings behind back, and tie legs with cooking string or silicon bands. Prep veggies and place in bowl. Combine ingredients for vegetable seasoning and whisk. Drizzle over veggies and toss. 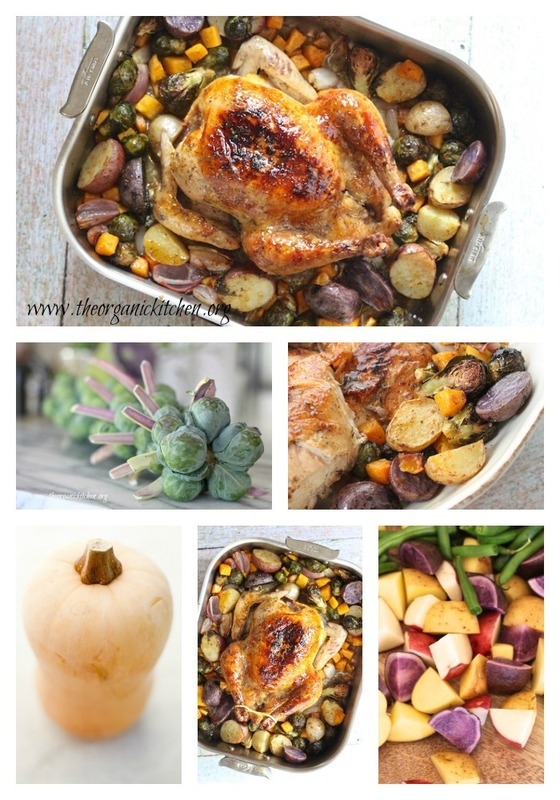 Place vegetables in roasting pan around chicken. While chicken is cooking place all ingredients for glaze into a small sauce pan. Bring to a low simmer stirring for 3-4 minutes or until sauce thickens slightly. Remove from heat. When timer goes off (at 1 hour 15 minutes) baste chicken with glaze using a brush. 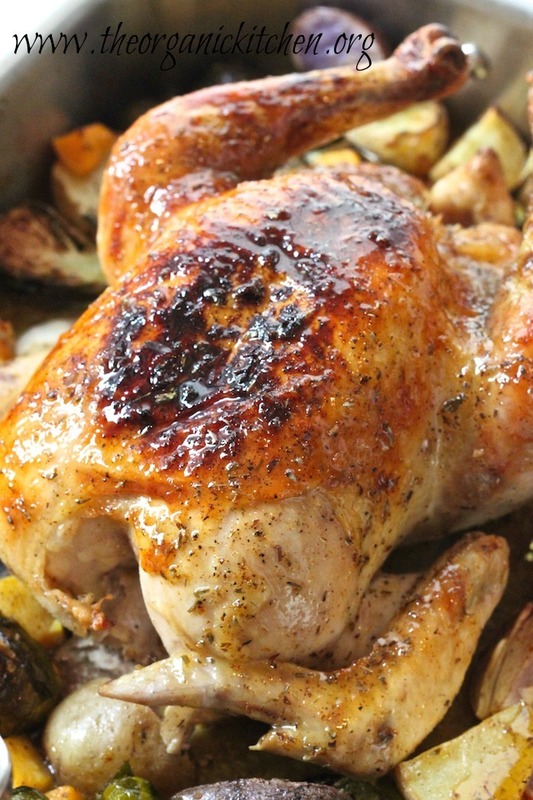 Remove chicken from oven when thigh juices run clear (usually an hour and a half total) or if using an instaread thermometer, when 175 degrees F is registered. 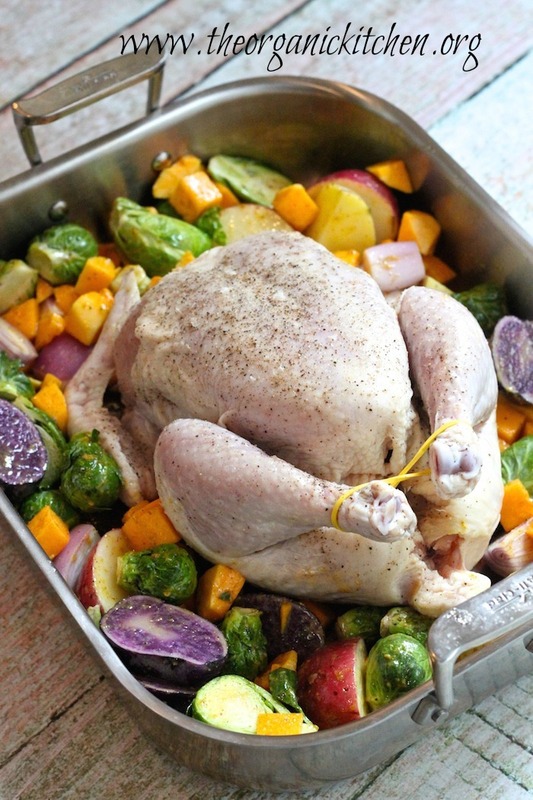 Place chicken on a cutting board and cover with foil to ‘rest’ for ten minutes. This redisributes the juices and allows the chicken to cool enough to handle when carving. If the veggies aren’t quite browned enough place them back in the oven allowing them to brown while chicken rests and then is carved. But keep a close eye on them. After chicken rests for ten minutes, carve.